The Sahara is not a dry and barren desert that just nomadic people roam around aimlessly .From ancient times It has been the home to a few but not to well known civilizations, Relative examples are the Soninke of the Ghana civilization and Sao Civilization. The Ghana civilization has its roots with the Soninke people who are known to have built the most ancient urban cultured hubs in Africa today. They are over a four hundreds settlements that date back to 2000 BCE to 300 BCE. One of the most well known locations are Tachitt Walata,Tagnant Cliffs, Augadouhst, and .Kumbi Saleh. The Soninke refer to their ancient civilization as Ghanta or Wagadu quite often. From 2000 BCE to 300 BCE it prospered until it was invaded by Berber tribes most likely the Sanhadja causing a brief dark age for nearly several centuries. The Soninke would regain their land taken in the 3rd century AD after they sack Akwar from the Berbers, to be ruled by the Cisse (king)Kaya Maja. Another brilliant constructed ancient African kingdom is the Sao civilization, it was to be precursor of the Kanem Bornu Empire and is thought to last from 5th century BCE to ending sometime in the 1st millennia AD. The Sao were another pinnacle example of the Africa’s “complex society”,the “Sao civilization” located in Southern Libya and Northern Chad was a legendary place according to the oral griots of the Kotoko and Kanuri that claim that it was to be inhabited by people who were giants,fierce warriors, an lived in tall city walls . Marinus of Tyre mentions” Agisymba “a country south of Garamentian territory Fezzan which is believed to be the Sao Kingdom, it was a country who’s subjects were to pay tribute to the Garamentian empire for a brief time. Trading with Agisymba was known to reach the of the possessions Mediterranean merchants . Sefuwa a ruling dynasty of Kanem Bornu from 11TH CENTURY A.D. to 14th Century AD to talk about blood drenched battles with” Sao people”in their distant past, and how Sefuwa became the most prominent dynasty and would dominate most of the territories of the Lake Chad Area. The “Soninke” people were very skilled artisans, craftsman, workers, agrarian laborers, and even superb wordsmith whose oral griots are mimicked by other local tribes such as the ‘’Mende’’. Soninke are thought to be one of the first people to utilize and capitalize on the use of “ironware” in the “Sahelian West Africa “region. It is believed by most archeologist and scholars that they are the main tribe responsible for the most remarkable settlements in West Africa that date back to the Second millennia bce. The reasons as to why the Soninke people were the first to create a hierarchy system of government within the region of Ghana is not certain but they are definitely elements that can be deduced. What is known is that the Soninke were the first in the Sahelian West Africa, who wielded the use of iron better than most of their near by tribes. They were not only able to conquer the nearby tribes, but they were also able to gain an upper hand due to their use of iron tools used for tilling the soil in agrarian production. Crops such as millet and sorghum are one of the many crops many neighboring tribe purchased from the “Soninke”. The” Soninke” yielded a surplus in these crops which boosted their economic foothold in the region. The Soninke were excellent blacksmith, and the Bamana blacksmith of “Mandinke Tribe ” , which was a subordinated tribe presided over by the Soninke ,are known to be astounded metallurgist who sold their ironware in bustling markets in on the outpost of the Empire of Ghana. The original name for Soninke is “Serahule” or Serahli, or “Serakole”. The name Soninke is actually a religious meaning for follower of “Sunni Islam”, which is due to their strong influence of Islam in their society today. The Soninke belong to a group of tribes called the “Mande” tribes or Mandinka tribes. “Mandinka “tribes would not only give rise to the Ghana Empire but they also gave rise to the Mali Empire. The Soninke called their land “Wagadu” or “Ghanata”. The name “Ghana “has two meanings “warrior King” or “King of Gold” . An ordinary “Soninke”,family consisted of a man, his wife or wives, their children, and their relatives. A big family was referred to as a clan, each family had a griot who would tell the stories or history of their families if they were wealthy. The Soninke people believed in a main god that created everything as most African religions do, but they believe in spirits in occupy both living and non-living things, which could be good or evil. But what cannot be missed is the citizens of Ghana including the Soninke and, their kin tribes Mandinke, and other tribes who were subjects ,all believed in their God King. The subjects of “Ghana” , fervently praised their God King. The throne of the King was called Dinga Cisse after one of its first emperors . The Ghana King adorned himself with necklaces around his neck, bracelets, and a cap embedded with gold wrapped in a fine turban. His court consisted of domed pavilion which had ten horses covered with gold embroidered materialism and on his right he had the sons of the vassal kings , wearing splendid garments with their hair plaited with gold .At the door of his pavilion were excellent dogs of a breed that had gold & silver collars. “Ibn Hawkal” wrote the emperor posses great wealth of gold that have been extracted since the early times, the king was so wealth they kept a thousand horses. According to AL Barki the kings palace was made of many dome shaped dwellings, surrounded by enclosures like the defensive wall of city. One of the kings mansions had a gold balcony, and its mansions was filled with numerous sculptures and paintings. It took large duration of time for the Soninke people to develop dominion over other tribes and retain authority over the surrounding lands. But it is known the Soninke were the first to organize a complex society and social system with hierarchy in Second millennia BCE. This society included laborers, herdsman, craftsman, and a judicial system. 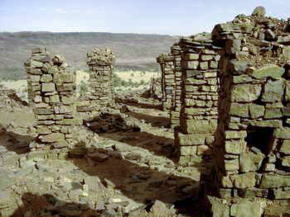 A glimpse of the Pre Ghana Era- can be seen throughout Southern Mauritania settlements in Tagant Cliffs and Tichitt Walata . These people had a rather stable and peaceful civilization from 2000 BCE to 300BCE. It was until later that Berber tribes most likely Sanhadja had incursions with the Soninke people which forced them to become displaced and lose their dominion over their lands, but their civil society remained intact, as it always has even until this day. The Soninke later returned to their original land in 300 A.D. and defeated the Sanhaja Berber tribes, at Akwar and exercised rulership in the land. The contemporary date for the Ghana Empire is 7th century AD, but according to Timbuktu book named “Tarikh as- Sudan”,the Empire of Ghana had 22 kings before the muslim common era ,which brings it back to the 3rd A.D., if we symmetrically round of each kings period of power. The king to defeat the Berbers is “DInga Cisse” or “Dyabe Cisse”.To ensure stability it is said that “Dinge Cisse” married the daughters of 3 kings of Berber Tribes. It is also said by many oralist that Dinge Cisse came from far away land. The Ghana Empire became very prominent and expanded from the 4th century AD onward. It became prominent for a variety of reasons, one of them was that the Wagadu Emperor and his vassal kings ability to properly moderate the ‘’Trans-Sahara trade’’ booming market . The Ghana Empire was primarily located in the Sahel, which was between the Savannah of Sub-Sahara Africa and the Desert of the Sahara. All traders and merchants who sold goods within in the empire were protected, and ensured security if they sold within the borders, this is why the empire had attracted many journeymen and merchants , it was very dangerous to sell goods in the Sahara due to rogue nomadic tribes who salvaged and plundered any caravan traveling the vast desert. Many were traders were ensured security in the territory of the empire, and so they went. But the traders had to pay taxes to the government, they also had to pay tariffs, to the king. Huge quantities of merchandise were sold within the empire like gold, livestock, Morroccan leather, weavers, and elaborate jewelry. They were many markets within the empire examples are Kumbi Saleh, these cities had shops of local potters, craftsmen, weavers, sandal makers. Kumbi Saleh was also had a huge garden in the middle. There were also shops for ironsmiths and coppersmiths who sold jewelry in these cities. Ghana’s economy was also based on Gold Trade. There were only a few tribes who were assigned to gold mining. One of them was called the “Wangara “were the primary extractors of gold. They kept their mining locations secret for fear of tough tribes and to lessen competition of other tribes extracting it. They of coursed paid large amounts of gold tributes to the Emperor. They were also the tribes of Sosso and Manlinke in who also participated in gold mining.The king only reserved the gold for himself, if the value of gold would’ve decreased throughout his empire if he chose to make it a public possession. Al-Hamdani describes Ghana as having the richest gold mines on Earth. Ghana Empire gains its wealth by taxing the all traders who sell within Ghana. If a traders enter the Empire of Ghana they will have to leave their iron, peacock, feathers, salt or any commodity at one post in return for goods that are sold there. A traveler could then trade his own item for a commodity he ventured of to Ghana for, without going to far within the empire if he chose to do so. The interesting part is that if textiles where brought in from the North they will be distributed in a rationed manner respectively throughout the kingdom. Traders and merchants would sometimes bring commodities of their kingdom’s own ‘’royal treasury’’, they would often leave surplus amount of goods within Wagadu due to it being trade centers were all kingdoms traded within. Merchants usually came to Wagadu (Empire of Ghana) to sell textiles, camels and salt. Salt was usually sold for gold, and was even worth more than gold within the empire, salt was used as the main currency. Slaves were also sold excessively during the reign of the Ghana Empire. The Empire of Ghana also taxed its vassals extensively and other tributary chiefdoms who bordered the fringes of the empire. The Empire of Ghana secured its territory with its strong army. According to “Al Barki” wrote in 1067 Emperor could disperse of 200,000 warriors and 40,000 cavalry men at any given time. Wagadu had gained more territory from 7th century to 11century. The Soninke people had many advantages over the armies of the neighboring territories. One of them was iron weapons and swords, and distinct superb disciplined military, with great attack formations. But the Soninke’s primary advantage was their ironmade weapons against the opposing tribes ivory and wood weapons. Their strategy was to defeat a clan or village allow the local ruler to remain in power, if he pledged allegiance to Ghana. Other times the king directly ruled over the conquered peoples without an intermediary or vassal. All conquered tribes or people were expected to provide soldiers for the army. Ghana had an estimated control of 800,000 km2 (308,882 sq mi) of land area at its apex. The Empire of Ghana was called that for the reason that Ghana means king in the Soninke language, Islamic and European scholars named it after the king because it seemed the king controlled everything. Indeed the king of Ghana was very powerful but not a tyrant. The King’s power was moderately regulated by those who were in charge of taxes, army, justice, and other duties. The central government of the empire had a long list of advisors. They local courts of chiefs and first officers decided that matters of local affairs, which were following the mandates of the higher imperial court of the emperors and nobles. The “Soninke’ people who dominated the government, had a 3 class caste system, the “Hooro” being the first, the ”naxamala” would be the second class caste ,and the last were “komo” who were slaves. Each one of these class systems had sub-divisions also. The “Hooro” also called “free men”, were ruling class that administered authority. One “class of Hooro” the “Tunnkalemmu” were appointed to carry out authority across local courts and had the right to reward or punish. After the Tunnkalemmu were the “mangu”. The “Mangu” are the advisors of the princes. When they are also problems between different princes the “mangu “play as mediators. In most cases the “mangu” are the chief of the Army for the princes since they are called the princes “right hand” man. The second level of the caste system would be the “naxamala” who were called the dependent men. The”Tago” which were blacksmith held the highest power. After the “blacksmith Tagu” were the ”Sakko”, who also were the masters of the wood who had great knowledge of the forest. Third to come of “Naxamala”were the “Jaroo”, who were somewhat like entertainers who sang and spoke anything they want, they were solely responsible for being orators and no one else but them could be orators, The last subdivision class of “Naxamala were the” Garanko” who were responsible for making leather and other woven goods. The last class of the 3 caste were the “Komo” who were slaves, and were often times harshly treated and used to work in for their masters, they were usually used to work in farming. The Empire of Ghana’s power began to disintegrate in 1059 AD. The causes of the decline, was the Emperor and his chiefs began to overtax the region ,the Sahara desert began to expand affecting the crop production of the lands, which resulted in most of its citizens becoming dependent on food from the outside. This caused a decrease in the surplus of food from the Wagadu famers, and which caused trade of cattle and crops to declined dramatically. The Ghana Empire also had very volatile subjects in its kingdom, one of them was the Berber tribe “Sanhadja” . They were great enemies of Wagadu before they came into power but they were pacified as a result, of them being main tribe that brought most of the salt into the empire. But the Sanhaja had defected to Almoravids who were Berber muslims encroaching from the North. The muslim religion also became a threat as it began to get a stronger influence in the kingdom which caused tribes disbelief of the Semi-Divine King(Ghana).The emperor was also not able to exercise his authority over distant sources of that supplied gold, copper, and silver as his resources began to decrease due to his territory retracting in area. So the King of Ghana decided to make a deal with the Soso a sonay speaking tribe(believed to be an offshoot of the Soninke)and Manlinke people who lived in area were the Emperors authority was weak. The Soso and Malinke tribe that were initially supposed to mine and extract gold on the behalf of the Emperor. The Soso tribe then double crossed the Ghana emperor and strategically then made initiative to make a conquest and hoarded of the resources for themselves the manlinke followed suit. The Soso and Manlinke of course renounced any allegiance under the Ghana king. Finally the “Almoravids” descended unto the territories of Ghana Empire and the Ghana Empire army and the Almoravids fought for 5 years from 1062. They both fought for 5 more years until the Almoravids gained control of the empire in 1067. Abu Bakr ibn Umar would eventually hold down all resistance, and his cousin Yusef ibn Tashifin would eventually rule the region with an iron fist. The Soninke attempted to resist the Almoravids for 10 years but were not successful, and the Soninke were finally constrained to a smaller kingdom in 1077. In 1203 AD the “Kante clan” a Mande tribe conquered every other Mande tribe including the Soso an Manlinke, Samunguru Kante a powerful leader eventually destroyed what was left of the remnants of the Ghana Kingdom. But although the kingdom was gone the Soninke were still able to keep their traditions together. The Soninke and the Ghana Empire legacy would live on as the ruler Askya Muhhamd I also called Askya the Great, of the Songhai Empire and was half Soninke inheriting his lineage from his father. Askya Muhhamad would be one of the greatest emperors in African history ruling over one of the biggest amount of territory known in Africa. Thank you for the interesting info about these fascinating old cultures and kingdoms. No Problem,they are many cultures of the world intriguing, but I chose to write about the Soninke and Ghana Civilization because of its complexity,and high level societal organzization that may be very much overlooked by a lot of historical experts. But feel free to ask any questions if this post has made an impression,and if you can find out more about civilizations like these in the Sahelian Sahara by doing research on the internet . Do add any information that may relate to the subject matter or input suggestive opinions that may broaden the perspective of this unique history. btw Here is a map to show you how the old cities of tichhit walata and Aughdoust were distibuted we are talking abot settlements in the BCE era that would of set the model of how the late ghana empire cities would be distributed.